This is my first year to join the Ultimate Blog Party, so thanks for stopping by! Welcome to The Mac Rak: Random Acts Of Kindness Blog, we are glad you are here. Please take a moment to bookmark this page so you can come back later . . . we are fun people to know, Scout's honor! What is The Mac RAK? Our blog is dedicated to inspiring R.A.K. (Random Acts of Kindness) in families, local communities and beyond. We love to encourage families to spend quality time together using hands-on parenting techniques like exploring nature, handicrafts, literature, science, volunteering, home educating and all around fun activities. We review family-friendly products and services and promote local and online events for the families we serve. Heather Mac, the Joyful Socks Mom, is a fun-loving mother to 5 amazing children between the ages of 24 and 8 . . . whew! Heather is a joyfully inspired writer and blogger, and when she's not doing that she is performing skits, speaking to home educators, teaching at the Classical Homeschool Cooperative, volunteering, reading, watching football, organic gardening, and (if it is a really good day) crocheting. Sleeping is something Heather would love to experience, but she may have to wait until the kids are all grown. Joyful Socks and her dear husband have lived in the North Texas area for over 20 years. Natural Play on a Dime! What is Ultimate Blog Party? 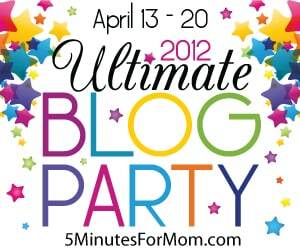 The Ultimate Blog Party is an online blog party running from April 13-20, 2012. Check out other Mom websites participating in the blog party by visiting the 5 Minutes 4 Mom site. Hi Heather!! I'm visiting fromt he UBP! I love knitting. I recently started making socks, and I'm hooked!! Here are my UBP links. Thanks for #UBP2012 Partying here! I'm headed over to party at your blogs. Thanks for stopping in to comment.